Occupational Standards - Maximum pollutant concentration levels, usually set by the Occupational Safety and Health Administration (OSHA). Organic compounds - Chemicals that contain carbon (as opposed to inorganic or 'mineral' compounds). Volatile organic compounds (VOC) vaporize at room temperature and pressure and are found in many indoor sources. OSHA - Acronym for the Occupational Safety and Health Administration, a part of the U.S. Department of Labor responsible for determining whether employers are providing working conditions that are safe for employees. o-Toluidine – CCL-3 EPA contaminant candidate;origin: used in manufacture of dyes, rubber, pharmaceuticals and pesticides. Oxirane, methyl- CCL-3 EPA contaminant candidate; origin: industrial chemical. Oxydemeton-methyl – CCL-3 EPA contaminant candidate; origin: insecticide. Oxyfluorfen – CCL-3 EPA contaminant candidate; origin: herbicide. parts per million (ppm) - parts of a dissolved/suspended constituent, per million parts of water or other solvent; one part per million is approximately equal to one milligram per liter (mg/L). Perchlorate – CCL-1 & CCL-3 EPA contaminant candidate; origin: naturally occuring and laboratory chemical, used in fireworks, flares, explosives. Perfluorooctane sulfonic acid (PFOS) – CCL-3 EPA contaminant candidate; origin: fire-fighting foams, few alternative chemical choices. Permethrin – CCL-3 EPA contaminant candidate; origin: insecticide. Poison - Any agent capable of producing a deleterious response in a biologic system, seriously injuring function, or producing death. ppm - The abbreviation for "part per million". Precipitate – can be noun – solid particles in liquid that can be removed by filtration; or verb – cause substance to settle. The term also refers to weather such as snow or rain. Preventive Maintenance - Regular and systematic inspection, cleaning, and replacement of worn parts, materials, and systems. Preventive maintenance helps to prevent parts, material, and systems failure by ensuring that parts, materials and systems are in good working order. they are imagining symptoms. Profenofos – CCL-3 EPA contaminant candidate; origin: insecticide. QA/QC - Quality Assurance/Quality Control procedures are used to assess method performance, accuracy, and precision. Quinoline – CCL-3 EPA contaminant candidate; origin: pharmaceutical and chemical production, anti-malarial drug, flavoring agent. Radionuclides – CA Prop65 List of Chemicals; origin: radioactive isotopes of certain elements – may emit alpha-, or beta- particles, or gamma rays, called ionizing radiation. Excess exposure can cause cancer(s). Risk Assessment - the scientific analysis of the toxic properties of a substance and its potential toxicity upon human exposure. Sanitizer - One of three groups of antimicrobial agents registered by EPA for public health uses. EPA considers an antimicrobial to be a sanitizer when it decreases, but does not necessarily eliminate, all the microorganisms on a treated surface. To be an EPA-registered sanitizer, the test results for a product must show a reduction of at least 99.9% in the number of each test microorganisms vs. the parallel control. Scientific Method - Systematic, step-by-step approach to problem solving. Sodium Hypochlorite - a chlorine-releasing material used for disinfection. The strength of sodium hypochlorite solution decreases on storage. Sorbent - A substance used for either absorption or adsorption. Staged Approach - A systematic, step-wise approach to investigation providing built-in decision points at which progress is assessed, and the investigation is redirected as necessary. Sterilizer - One of three groups of antimicrobial agents registered for public health uses. EPA considers an antimicrobial to be a sterilizer when it destroys or eliminates all forms of bacteria, fungi, viruses, and their spores. Because spores are considered the most difficult form of a microorganism to destroy, EPA considers the term sporicide to be synonymous with sterilizer. Surfactant - a soluble surface acting agent that reduces surface tension between particulate matter and water. Threshold - The lowest dose of a chemical at which a specific measurable effect is observed. Below this dose, the effect is not observed. Total Bacteria Count (TBC) - an estimate of the number of viable units of bacteria per milliliter of water under the conditions of testing. Note that no single method, culture medium or conditions of incubation can satisgy the growth requirements of all bacteria in a water sample. Toxic - Harmful, poisonous, dangerous to health; can cause or induce a variety of health risks; at worst can be fatal. Toxicity - The innate ability of a contaminant to cause injury to biological tissue. Toxicology - The study of the adverse effects of chemicals on living organisms. TSCA - Toxic Substances Control Act. Turbidity - a cloudy appearance in water that is caused by a suspension of colloidal or particulate matter. TVOCs - Total volatile organic compounds: these are compounds that evaporate readily and have low solubilities in water; generally man-made in origin, their presence in water is a sign of local contamination issue – such as factory run-off. Two VOCs that may be found in unpurified drinking water are Benzene and MTBE. VOCs - See Volatile Organic Compounds. Water pollution – has many sources, both natural and man-made. 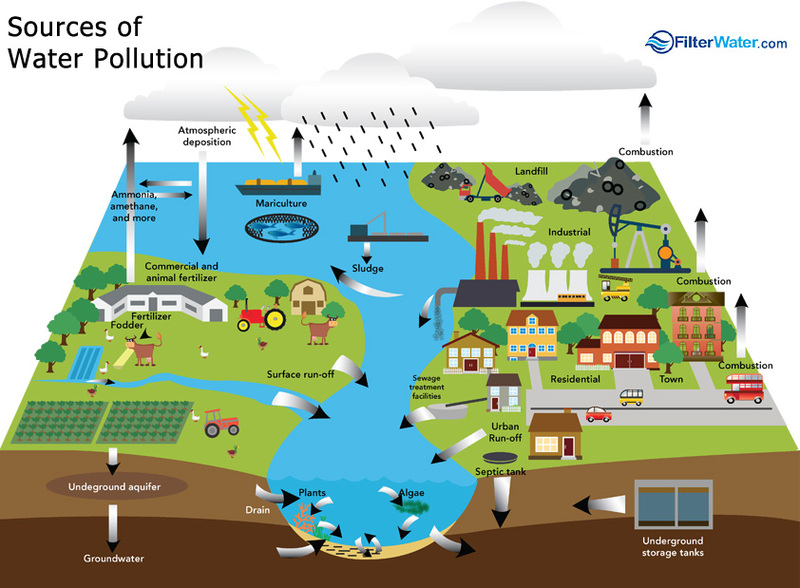 As shown in the figure at <http://www.filterwater.com/images/upload/waterpollutionsources.jpg> they range from atmospheric deposition to fertilizers and pesticides to industrial deposition, and runoff from rural and urban sources <http://www.filterwater.com/asp/cs/water-pollution.asp>. WHO - Acronym for the World Health Organization. WQA - Acronym for the Water Quality Association.